This research received financial support from Science Foundation Ireland­ under Grant Numbers 12/RC/2275, 05/PICA/B802/EC07, 14/US/E2915 (UBRK) and the UCC Strategic Research Fund (UBRK and DJJ). 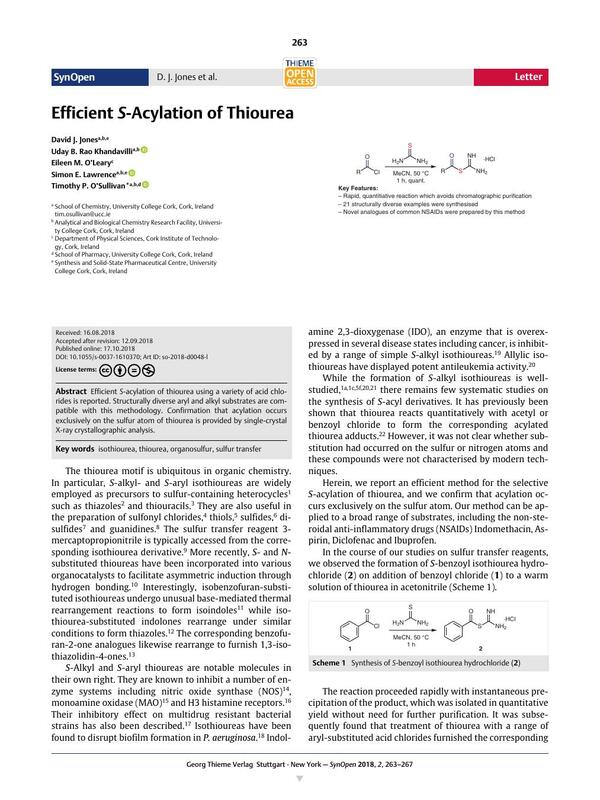 Efficient S-acylation of thiourea using a variety of acid chlorides is reported. Structurally diverse aryl and alkyl substrates are compatible with this methodology. Confirmation that acylation occurs exclusively­ on the sulfur atom of thiourea is provided by single-crystal X-ray crystallographic analysis. Details of the crystallographic analysis of compound 5 and full characterisation for all novel compounds with associated 1H and 13C NMR spectra can be found in the Supporting Information. The crystallographic data associated with this article have been deposited with the Cambridge Crystallographic Data Centre, CCDC 1586073. Supporting information for this article is available online at https://doi.org/10.1055/s-0037-1610370.